It may not fly or fight.. it looks like it is ready to fall apart. However it most certainly is cobbled together using at least some parts of a Bell 206. The position and design of the horizontal stabilizers, vertical stabilizers, and the engine exhaust outlets are a dead giveaway. If they give me the kits I'll put them together and fly it. I am prity sure it'll fly better than mosquito's. Looks like they went Macgyver on them and cobbled together a gunship lol. This looks just like a plastic toy helicopter you can buy at Walmart. Those Iranian bastards, I guess with the current sanctions all they can do is try to make copies of toys they see at Walmart.com. 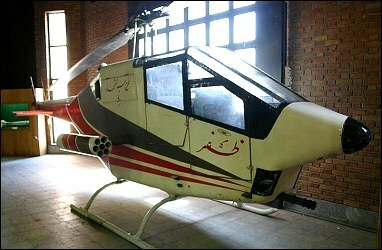 Mohamid woulden't fly in this badly designed pig of a bacon eating copy of a pigs helicopter,I KILL YOU,,,,or it would Kill any one near it,under it or over it. There was some Cobras that we gave Iran in the good ole days prior to the revolution. Looks like they went Macgyver on them and cobbled together a gunship lol. Looks like a piece of crap!